The next example is RetroBand virtually circuit bended into generating rain and thunder. No source audio is necessary for this. For the next examples RetroBand is first bypassed, then switched on. RetroBand models several interaction aspects of gain stages and transformers. It generates IMD and crossover distortions present especially in Class A/B gain stages. RetroBand also features several forms of transient shaping. As opposed to sterile but perfect digital sound, IMD and cross-over distortions can sound good. They are present in most vintage gear. There are three different models in RetroBand generating distortion for a good range of sound shaping. No particular piece of equipment is simulated in any of them, but the combined flexibility can generate some of the desirable aspects of great sounding gear. It could be said RetroBand is one of the missing links to analog sound in a digital audio workstation. 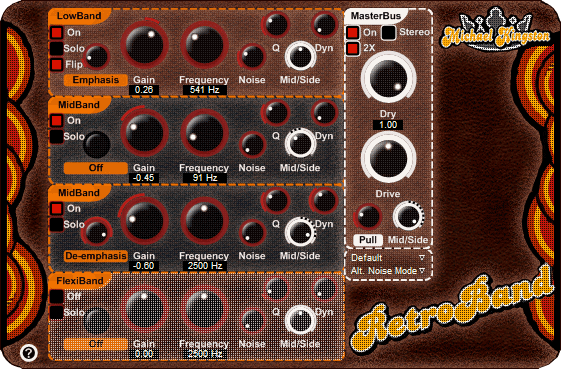 RetroBand is a distortion unit at heart. It does warming, sharpening, roughing up, softening and smoothing - or all these combined. It may enrich sterile sound sources. Failing equipment can be easily simulated. With some luck it makes things sound larger than life. The transient enhanced distortion models with mid-side stereo controls can change or revive a stereo image. Note to Windows users: the plugins are stable with 64-bit VST host applications using jBridge. Note to OSX users: there's no AU or RTAS support but the plugins work with VST-to-AU and VST-to-RTAS adapters. 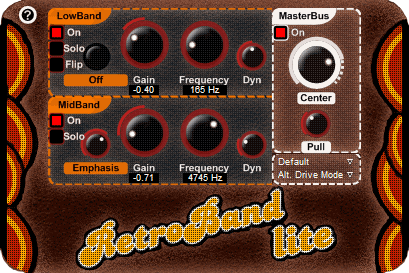 RetroBandLite is a streamlined plugin designed specifically for basses and all things mono synth. Protip: always start with RetroBandLite.